UP Basic Education Parishad Recruitment: Online Application forms are invited by Government of Uttar Pradesh from all eligible and interested candidates for the Recruitment of Sahayak Adhyapak Jobs on direct Recruitment basis. As per Notification, total Available Vacancies are 12460. Application mode is Online. Closing date for Online registration process is 09th January, 2017. Closing date to submit Application forms is 13th January, 2017. 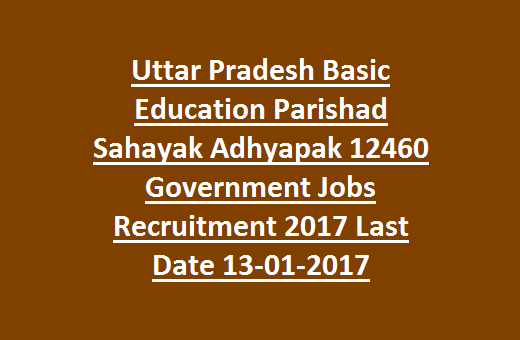 All details of UP Basic Education Parishad Recruitment Notification 2017 for Sahayak Adhyapak Government Jobs mentioned below. As per Notification, total Available Vacancies are 12460. Candidates should have the Qualification of degree and two years BTC Special training or D.Ed. Special Education or B.L.E.D.TET passed candidates are eligible to apply. Minimum age limit for general category candidates is 21 years and maximum age limit is 40 years as on the last date of Online registration forms. There is a relaxation in age limit up to 5 years for Scheduled caste, Scheduled tribe, Other Backward Classes (OBC) candidates. To get Pay Scale details for above Jobs, candidates please go through Official Notification. Selection committee will recruit candidates based on merit in educational qualifications only. Candidates who belongs to general, Other Backward Classes (OBC) category have to pay the Application fee of Rs.500/-; for Scheduled caste, Scheduled tribe category candidates Application Fee is Rs.200/- through E-Challan at any branch of State Bank of India. Candidates must log on to Official Website of http://upbasiceduparishad.gov.in/ to apply Online for above Jobs. Before apply Online, read all instructions carefully and fill with required details. Closing date for Online registration process is 09th January, 2017.